Causes of deteriorating dental health among low-income children can be attributed to a lack of access to proven preventive measures, including sealants and fluoridation; too few dentists willing to treat Medicaid-enrolled children; and in some communities simply not enough dentists to provide care. Cavity Free at Three works to address these problems by integrating prevention into well child care and expanding access to care for those most in need. This public will building campaign from Delta Dental of Colorado Foundation has a wealth of information and resources about preventing cavities in children. Delta Dental of Colorado administers the CHP+ dental benefits portion of this program. CHP+ shares the commitment with Delta Dental of Colorado to improve the oral health of Colorado children by improving access to dental care. The Colorado Oral Health Surveillance System (COHSS) monitors the burden of oral disease among Coloradans. The COHSS is the result of a collaborative agreement between the Centers for Disease Control and Prevention (CDC), and the Colorado Department of Public Health and Environment (CDPHE). The CDPHE represents one of thirteen states responding to the 2002 federal initiative to test the feasibility of developing state oral health surveillance systems. DentaQuest serves 15 million Medicaid, CHIP, and Medicare Advantage members, and 30,000 dentists nationwide. Our goal is to form lasting connections between members and providers. We make it easy for you to participate in our programs and keep a healthy smile. 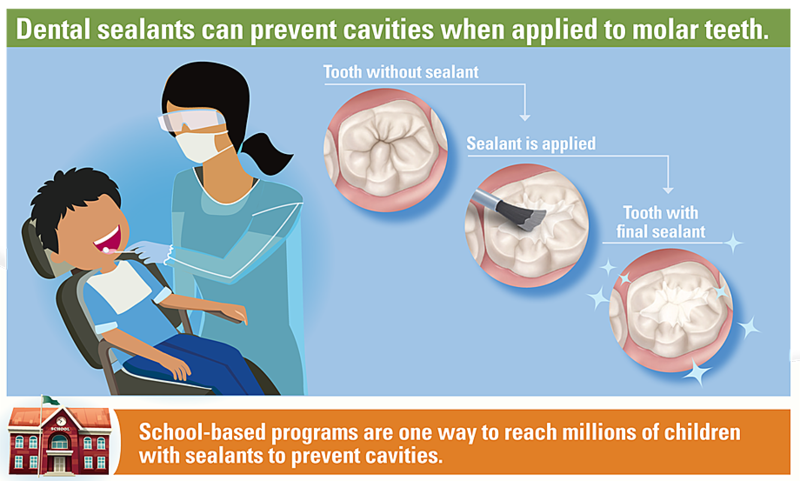 This infographic from the CDC provides a quick visual overview of the value of sealants. You can also visit the CDC’s webpage about sealants that provides more information. Learn more about the importance of planning for onsite hazards, equipment safety, and site specific OSHA programs. Watch the full webinar from the School-based Health Alliance here.